Jennifer Anderson’s practice is focused on employment, class actions, mass torts, insurance, healthcare, products liability and commercial litigation. She regularly advises businesses and individuals on issues related to employment disputes, contracts, negotiations, medical malpractice, product safety, professional liability, and fair debt collection practices. She has appeared in state and federal courts, and regularly participates in arbitrations and facilitations. She is also a Certified Mediator through University of New Mexico School of Law. 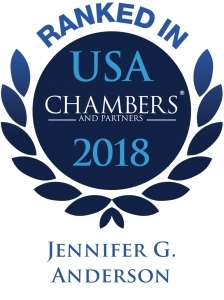 Chambers USA has recognized Jennifer in the areas of Labor & Employment law and Litigation, and in the 2017 publication states “[she] has a broad focus within labor and employment law, including matters pertaining to discrimination, retaliation, contract claims and employee relations issues.” Clients were quoted as saying, “Jennifer is amazing. She is smart, gives good advice and keeps us out of trouble. She is exceptional at avoiding litigation.” Benchmark Litigation has selected Jennifer as one of the Top 250 Women in Litigation in the U.S. and a local Litigation Star, and Benchmark Litigation, Labor & Employment names her as a Star. Additionally, she has an AV® rating from Martindale-Hubbell and is among those in listed in Best Lawyers in America® and Southwest Super Lawyers®. 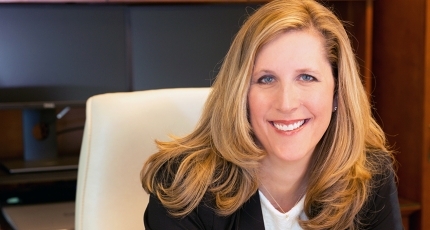 She serves as Chair of the firm’s Employment practice group; she previously served on the firm’s Executive Committee and as Chair of the Litigation Department. Jennifer enjoys cooking, skiing, soccer tournaments, and spending time with her family.